Mr. BELIN - I want to take you back to November 22, 1963. This was the day that President Kennedy was assassinated. How did you find out about the assassination, Mr. Brewer? Mr. BREWER - We were listening to a transistor radio there in the store, just listening to a regular radio program, and they broke in with the bulletin that the President had been shot. And from then, that is all there was. We listened to all of the events. As we can see, Weissman arrived in Dallas around the same time as Bill DeMar claims he did. In my essay “Who was behind the assassination?” I discussed the likelihood that the purpose of the black border ad (with the Jewish Weissman’s name on it) was to give the impression that the Jews were behind the assassination. I believe that is also a reason why Jack Ruby (someone of Jewish ancestry) was chosen to kill Oswald; to make it look like they were part of a Jewish conspiracy to kill the President and that Ruby killed Oswald to prevent Oswald from implicating him (Ruby) in the conspiracy. See under the subheading “Blaming the Jews” in my aforementioned essay for more. Whilst some might say that DeMar simply confused Larry Crafard for Oswald, I don’t think this was the case. I think he was deliberately trying to give the impression that Oswald and Ruby knew each other before the assassination. Was DeMar the stage hypnotist Robert E. Doran wrote about? I believe he was. 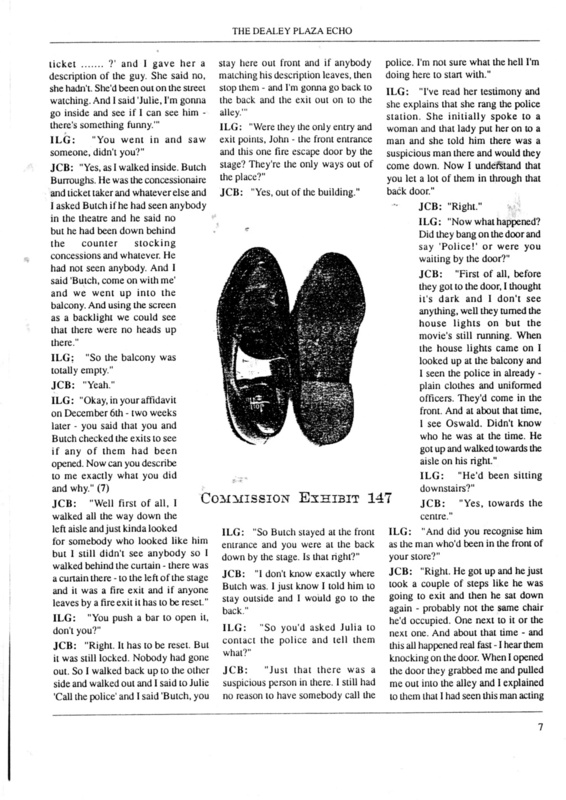 Was there a connection between the mysterious IBM instructor Doran wrote about and Johnny Brewer’s shoe store? I don’t know, but I have a feeling there was. So we have Robert Radelat who it is said was working for IBM in November, 1963, and we have a Guido Radelat who was a member of an anti-Castro organisation who “specialized in writing computer programs.” Were they related? I sure would like to find out if they were. Let’s keep in mind that Sylvia Odio said that the two Cubans who showed up with the American, “Leon” (whom Greg and I suspect might have been Herbert Leon Lee) in late September, 1963, were members of JURE. Therefore, it’s possible that one of the two men was Guido Radelat. 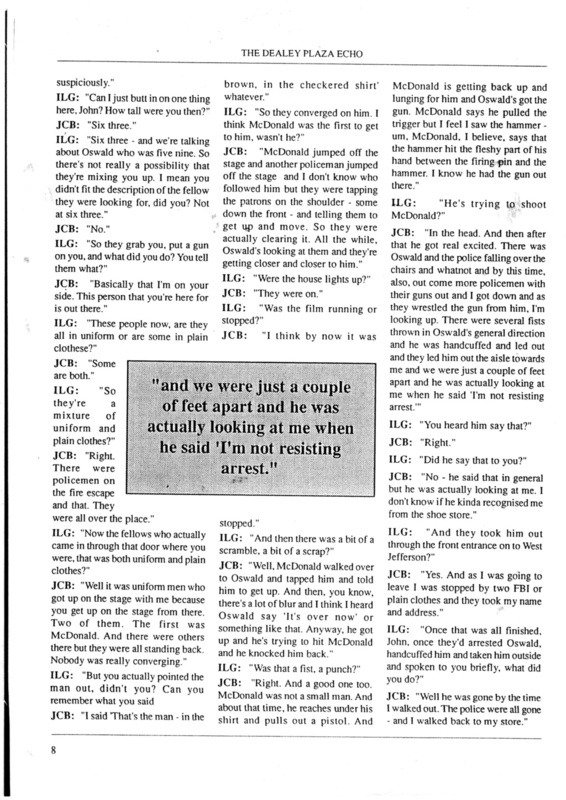 I once put forward the idea that Herbert Lee and his friend, James Douglass Watson (who was supposedly living with Lee at the 1026 North Beckley rooming house), were involved with Jack Ruby and Larry Crafard in gun running. Interestingly, a Thomas J. Watson had served as chairman of IBM from 1914 to 1956. His son, Thomas J. Watson Jr., evidently took over his father’s role about a month before his father’s death. As many of us probably know, Rich told the Warren Commission that she was involved with Jack Ruby in gun running. Was she trying to hide something when she said that she made a “misquotation?” It sure seems that way to me. With this in mind, I find it all the more likely that the stage hypnotist Robert Doran wrote about was Bill DeMar (see my first post in this thread). I also think the IBM connection to the Nazi regime makes it all the more likely that one of the IBM men in Brewer’s shoe store was the R. Ted Smith Ed LeDoux and I pointed out; as he was acquainted with the anti-Semitic, H. L. Hunt. 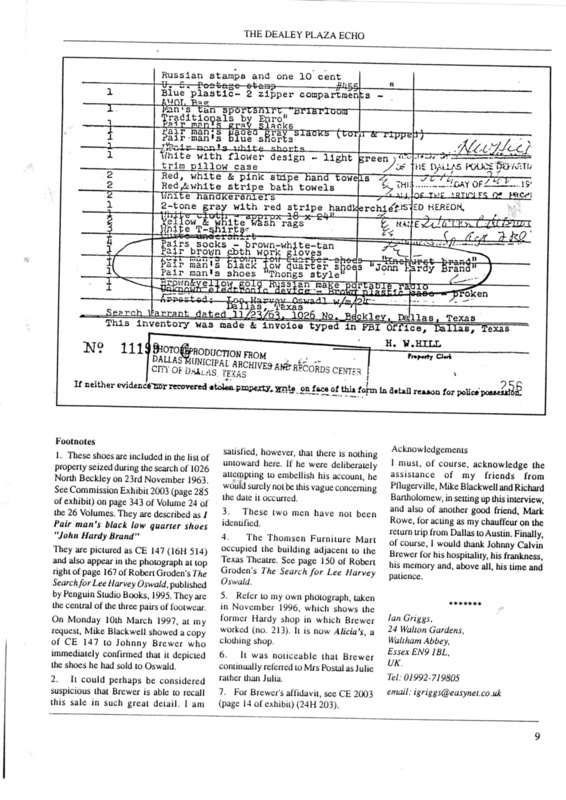 Given that he was living nearby to Brewer’s shoe store in Oak Cliff at the time of the assassination, and that he was working for the Nazi connected IBM (with Nazi beliefs himself), and that we have good reason to believe that some of those involved in the conspiracy wanted to give the impression that the Jews were behind the assassination, there is now very little doubt in my mind that Vaganov was one of the IBM men in Brewer’s shoe store. Hasan wrote: Doran writes that two of his Air Force “buddies” were hypnotised by a professional stage hypnotist from Dallas named “Bill” who was brought along by a mysterious IBM instructor. The reason I find this interesting is because William Crowe (aka Bill DeMar), who was the master of ceremonies at the Carousel Club, was evidently involved with hypnosis. I recall Greg Parker once discussing at google groups the possibility that DeMar had hypnotised Jack Ruby to shoot Oswald (sorry if I have got that wrong, Greg). 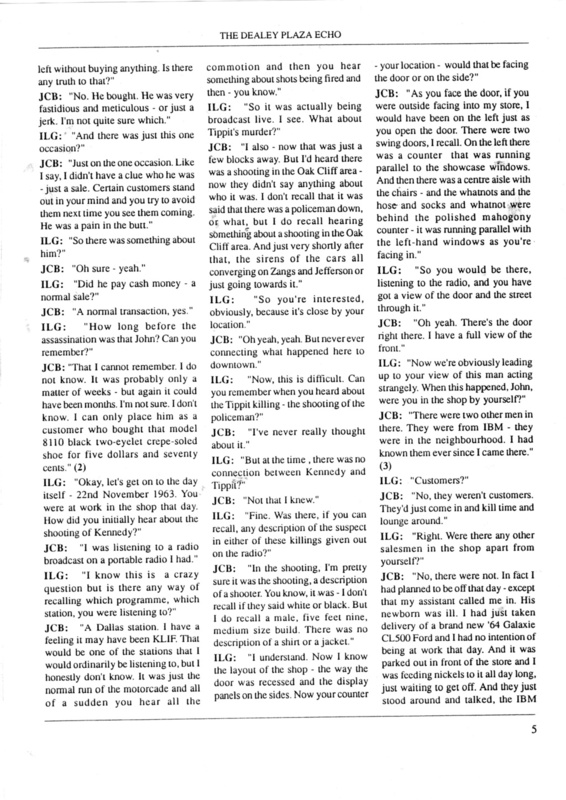 DeMar told the Warren Commission that he arrived back at the Carousel Club around November 1, 1963. He was taking Preludin by the fistful. He had a hypnotist as his MC (who had also performed in the army). He was reading Bircher propaganda and inexplicably, was looking for more expensive digs and a new business despite being 40K in debt to the IRS - who had imprisoned and/or taken assets of other low level mob types in less debt. He also believed his family was in danger. As for DeMar, I contacted him years ago pretending to be a magician wanting to branch into hypnotism. He tried to sell me his "how-to" videos on it. There was also a promo found in Zoppi's which included hypnotism as part of his act - yet post-assassination, that part of his act was suddenly not up for discussion. On the debit side, he was not from Dallas, and he first worked for Ruby in 1962. Doran has him in Dallas in 1960. A couple of case studies from the 1950s on Preludin addiction. Note that in case 2, the patient believed that Nazis were out to kill her. Thanks for the info, Greg. Great to see you here! I don't want to come across as a Nazi sympathizer nor an antisemitic but wont discount the Zionist connection. JFK was no Zionist fan unike Obama and the current crop of political Democrats and Republicans around today who dhamelessly are and defend Israels atrocities like a relex action. Lets not forget Hitler had no trouble borrowing money from the US and many useful Nazis were conveniently settled in the US not only the top scientists. I believe it a ruse. There has been talk that Rothschild encouraged the rise of Hitler and the Jews who were persecuted were selective rather than anything more significant than simply their jewness. Zionists are a different breed of Jew. They advocate their own free state while most Jews who were routinely rounded up were just moderate. They weren't rich or powerful. JFK made no secret of the fact he was an anti Zionist no matter how much spin there is about him not being one. His federal reserve reforms was a great concern to many. Nazis like Vaganov being implicated in the plot isn't so far fetched in colusion with parties you wouldn't normally consider to be bedfellows. This was a sinister and deliberate plot. I won't derail this thread anymore Hasan but since the Nazis were brought up I want to note how they were used by U.S intelligence. You won't get this in the history books. Only thing I can add would be the possibility Brewer misquoted IBM and it was another three letter group. Not likely though. As Griggs confirmed the initials. On a technical note, how did the IBM'ers lock the shoe store? JCB came back and said it was locked up by them. Neat trick locking up without a key, even with a key how did Brewer re-enter? Did they leave the key under a shoe outside for him? Did the IBM guys have keys to the store??? Or did they just lock out Brewer, and remained inside. If they remained there why did they not watch the excitement and cops arresting someone a few doors away? If the IBM'ers did leave why has Brewer never given their names to help bolster his claims? 1, they would not bolster his story but would claim it was not the same person arrested. 2, The are not persons whom wanted their names involved. Odd as they would be as heroic as Brewer if they came forward. Until Brewer discloses the names he contends were his IBM friends then I will continue to believe Hasan has gotten closer with help from Lee Farley and Greg Parker and ROKC to find out why Brewer's Buddies are unnamed. Dallas: Police Lt. Jack Revill said he had a witness description of a man who pasted Nazi swastikas on about a dozen downtown stores of Jewish merchants. The black swastikas were on a red background and declared “We Are Back.” The decals were placed on businesses on Elm and Commerce streets. Only after Jews were identified -- a massive and complex task that Hitler wanted done immediately -- could they be targeted for efficient asset confiscation, ghettoization, deportation, enslaved labor, and, ultimately, annihilation. It was a cross-tabulation and organizational challenge so monumental, it called for a computer. Of course, in the 1930s no computer existed. But IBM's Hollerith punch card technology did exist. Aided by the company's custom-designed and constantly updated Hollerith systems, Hitler was able to automate his persecution of the Jews. Historians have always been amazed at the speed and accuracy with which the Nazis were able to identify and locate European Jewry. Until now, the pieces of this puzzle have never been fully assembled. The fact is, IBM technology was used to organize nearly everything in Germany and then Nazi Europe, from the identification of the Jews in censuses, registrations, and ancestral tracing programs to the running of railroads and organizing of concentration camp slave labor. IBM and its German subsidiary custom-designed complex solutions, one by one, anticipating the Reich's needs. They did not merely sell the machines and walk away. Instead, IBM leased these machines for high fees and became the sole source of the billions of punch cards Hitler needed. IBM and the Holocaust takes you through the carefully crafted corporate collusion with the Third Reich, as well as the structured deniability of oral agreements, undated letters, and the Geneva intermediaries -- all undertaken as the newspapers blazed with accounts of persecution and destruction. Just as compelling is the human drama of one of our century's greatest minds, IBM founder Thomas Watson, who cooperated with the Nazis for the sake of profit. Only with IBM's technologic assistance was Hitler able to achieve the staggering numbers of the Holocaust. Edwin Black has now uncovered one of the last great mysteries of Germany's war against the Jews -- how did Hitler get the names? If they were his friends then why not be checking out Brewer's brand spanking new Galaxy 500? Seemed Brewer spent most the day running out to feed the meter. Anyone spotted a new 500 in any pics from the Texas Theater and arrest of LHO down the street by the Hardys Shoe Store? Motorcade on Lemmon Avenue. “To O’Donnell and O’Brien the spectators outside the low, flat automated factories – Haggar Slacks, and IBM – looked like curious but indifferent white-collar workers. Was Brewer looking to move up the corporate ladder? Would ID'ing a cop killer help his cause? What was the IBM corp looking like in '63, are the boys from a subsidiary? IBM forms three new divisions: Industrial Products; Real Estate and Construction; and Research. IBM introduces several different kinds of teleprocessing systems, including the 1030 and the 1050 data collection system, and the 7740 communication control unit. IBM employees and computers help NASA track the orbital flight of the Mercury astronauts. New facilities are completed in East Fishkill, New York; Lexington Kentucky; Rochester, Minnesota; and Bombay, India. New laboratories are established in Zurich, Switzerland; La Gaude, France; and Vienna, Austria. 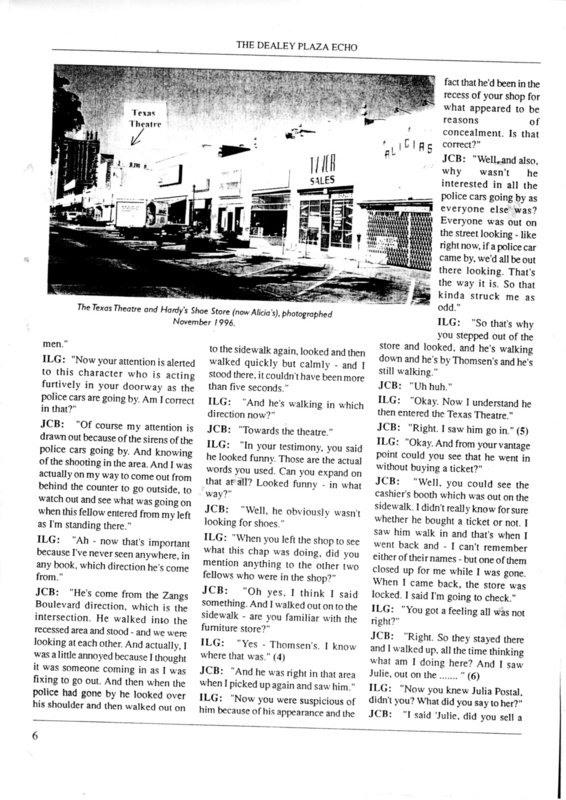 Add Lawrey and his shoe store just down the block and one must seriously question the arrest tales told. The FBI/Postal System use of the IBM machines to trace that "Postal Money Order" are but another coincidence of IBM involvement or being drawn into the case. Herbert Leon Lee would have run into the rooming house and grab his jacket to go downtown and see the excitement . Interestingly this fits with what we know to a tee. Herbert Lee (Mr. Lee to Earlene) ran in, was seen by the housekeeper Earlene Roberts. Said to grab a jacket and run out, last seen standing at the bus stop for a downtown bus to go where else, but to go see what was happening in Dallas. Nah, nothing to see here once again Hasan. Since, as a new member, I'm not allowed to post links for 7 days, I'll just have to refer you to them manually. On December 6, 1963 Thomas Crigler was interviewed by the FBI. 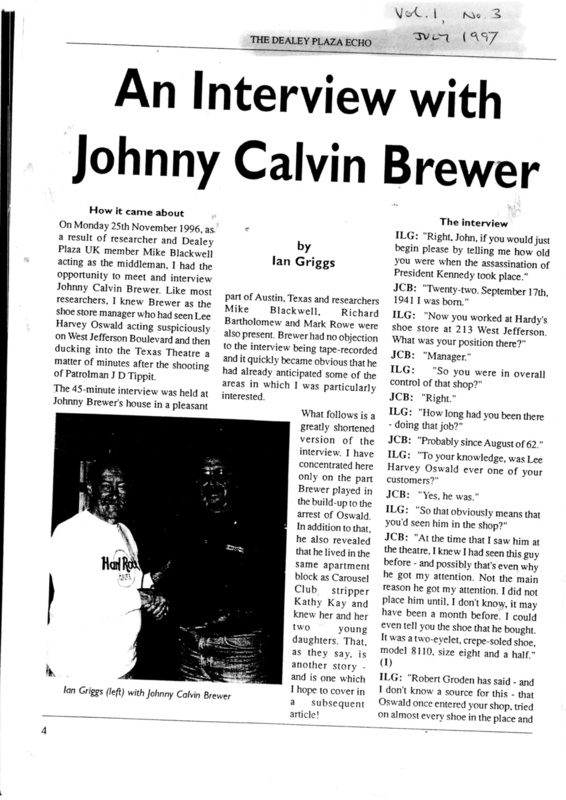 He said that he met Olfstein (Dennis Hyman Ofstein of Jaggars-Chiles-Stovall fame) “accidentally” on the street. Crigler said he was “currently assigned to the U.S. Army Recruiting Station”, which would make sense since, as I understand it, it was the Army Security Agency's practice to hit up on new recruits to join the ASA, even before they got sent to basic training. “While working in Heilbronn I received a phone call from a 206 at one of our other Processing Companies saying that an IG Inspection team had just been through his unit, and looked under the covers of one of the machines. When the IG found a rather big mess of old oil and card dust he demanded to know why it wasn’t nice and clean. The 206 quickly explained that it was IBM’s policy ‘not to disturb the dirt’. As much as he would have liked to clean it up, he had to follow IBM’s maintenance orders. He suggested that if my machines were clean, I’d better get them dirty before the IG arrived. “Jim Campbell in his email said “(When I was in, no 206 had ever re-enlisted - IBM had a job ready for them when they got out. )” When I got out I went to the IBM office in San Francisco, showed them my diploma with TJ Watson’s signature and asked for a job, they asked me what I knew about computers, so I told them I’d seen one in Germany. I got the hint when they said ‘Goodbye, thanks for stopping in”. (A 206 is an MOS, or Military Occupation Specialty Code I believe). If it is the same one (and I believe it is), the Army Recruiting Station is at 3434 W Illinois Ave, #114 in Oak Cliff. This is about mile or so, southwest of the Texas Theater. Crigler's home address of 1705 McAdams is just off of Illinois. Steve Thomas wrote: Since, as a new member, I'm not allowed to post links for 7 days, I'll just have to refer you to them manually. Apologies, Steve. It's just part of how the forum works/ Presumably it is to discourage spammers. What do you understand a "tab operator" to be? Since he said he moved to Australia, it may be what we understand it it to be... a betting shop.= - but maybe it has a different specific meaning in the US? That's okay. That's the way I took it. "TAB operators sell bets, pay out winning dividends, display sport and race information, support promotions and help customers." So, like you, I figure that's what he was doing in Australia while he studied computer programming. TAB is actually an acronym for Totalisator Agency Board. As with a lot of small countries, such enterprises were initially government run operations and gradually privatized over the years. Of course, the TAB has reduced attendance at the track, a fact of life that tracks accept. "We know you can't have your cake and eat it too," said Pat Parker, chief executive of the Sydney Turf Club. But the tracks here still attract healthy crowds and retain an air of vitality, because on-course bookmakers remain legal. Rather than viewing them as rivals for the betting dollar, TAB and track officials know the bookies are an essential part of the game. "They bring people to the racecourse," said Parker. "They offer fixed odds and they give big players the opportunity to play. And they add a lot of atmosphere." He pointed out that the bookies' existence creates business for the tote because of arbitrage situations. If one horse is 2 to 1 with the bookmakers and 5 to 1 on the tote, while the odds on another horse are the reverse, sharpies will be betting heavily to exploit the opportunity. But if the arrival of the TAB was a bonanza for tracks and state governments, it was also a boon for bettors. When smart handicappers had to do battle with the bookies, it was a duel of wise guys vs. wise guys. But now billions of dollars of unsophisticated money -- they call it "mug money" here -- were flowing into the tote pools. "Our dual betting system makes this the best place in the world for a punter (horseplayer)," said Shane Templeton, a journalist and professional punter in Melbourne." Quite a few tells in this accounting by JCB. Seriously he should get his story approved by someone before going public. He stated elsewhere that cops search the balcony and it occupants while he watches. Claims he sees Lee not buying a ticket. Claims ticket booth is out on sidewalk. Claims Butch watched front as he watched back exit. There was also a balcony exit, the one Butch checked, but Butch went back up front and did not stay at it. Who locked up for Butch... but he doesnt know their names. My good friends husband died!